It’s been over two weeks since the big announcement concerning the alleged discovery of gravitational waves by the Laser Interferometer Gravitational-Wave Observatory (LIGO). Although a few outliers have since pushed back, for the most part this “discovery” has been accepted unquestioningly by the vast majority of the scientific community and media outlets. I would like to begin by stating that I personally believe that gravitational waves could exist. So far all of Einstein’s predictions have proved to be correct, why would this final one be any different? However I have serious doubts about whether human beings will ever be able to develop the technology to really observe them, as did Einstein. This latest claim to have finally detected gravitational waves does seem exciting at first glance. But like the BICEP2 claim, it begins to fall apart under closer scrutiny. The first problem with LIGO’s discovery claim is that it is not born of scientific rigor. Any experiment should follow the scientific method, one of the fundamental tenants of which is that test results should be verifiable and repeatable. Yet after weeks, months and now years of testing and observations LIGO has come up with only one example of gravitational waves, and a contestable one at that. Conveniently, Italy’s VIRGO interferometer was being upgraded and Germany’s GEO600 interferometer was not in observational mode at the time of this single detection by the LIGO instruments. This lack of verification and additional results should in and of itself disqualify this singular observation from being claimed as a real discovery. It was extremely unprofessional and grossly unscientific for the LIGO team to do otherwise. But their actions aren’t really all that surprising considering the decades of research and billions of dollars that have been spent trying to detect gravitational waves. The researchers were under tremendous pressure to come up with at least one result, especially with the 100th anniversary of Einstein’s original prediction fast approaching. After the last set of upgrades some of the researchers were quite certain LIGO would find gravitational waves or noted that it would be very surprising if it did not. Such biased predilections were obviously going to eventually lead to only one possible outcome. But it wasn’t just the researchers that were biased; the research itself was extremely biased and was set up to produce only one possible outcome: the detection of gravitational waves from merging neutron stars and black holes. Careful review of the LIGO team’s published paper in the Physical Review Letters reveals the extent of this bias, and their desperation to try to make the observations fit their theories. To start, the paper gives a range of figures for the distance and sizes of the two black holes that are supposedly the source of the gravitational waves. The margin of error for these ranges is over 40% and almost 15% respectively. In any other setting such numbers would be considered educated guesses at best. The paper describes the detectors’ components and how they are protected against external environmental influences and noise. It is interesting to note that “all components other than the laser source are mounted on vibration isolation stages in ultrahigh vacuum”. It is not explained why the laser source was not isolated in the same manner or how it was isolated at all. The paper also mentions that the mirrors used in the detectors are isolated from seismic and thermal noise by being suspended from a “quadruple-pendulum system supported by an active seismic isolation platform” using fused silica fibers. Nothing is mentioned about how or even if the mirrors and other components of the detectors are isolated from other forms of electromagnetic radiation and external influences. It is mentioned that each observatory site is equipped with an array of sensors to monitor “environmental disturbances and their influence of the detectors”. But nowhere is there any indication that any other sensors outside of the detector sites were consulted, even those operated by any of the many institutions that are part of the LIGO collaboration. It should also be noted that the LIGO detectors were built to detect gravitational waves that travel perpendicular to them, stretching and compressing the lengths of their long L-shaped arms. However the time difference between the two signals was less than 7 milliseconds meaning the waves must have traveled more parallel to the detectors. This would have made them significantly more difficult to detect. Despite all the elaborate noise isolation features, quite a significant amount still made it through to the detectors. The paper describes the noise as “non-stationary and non-Gaussian” or in other words, random. A variety of techniques were implemented to attempt to clean up the noise, including the use of band-pass and band-reject filters. But what is truly disturbing to me are the techniques that were used to supposedly isolate a signal from all that noise. Basically the researchers first looked for any type of strong waveform patterns with “durations up to a few seconds” buried in the random noise. They then compared these strong signals to “approximately 250,000 template waveforms” until they found a match in both detectors within 10 milliseconds of each other. That’s akin to waiting for one of a quarter million sequences of numbers to appear almost simultaneously between two continually running random number generators. Given enough time and that many acceptable sequences, an eventual match is guaranteed to appear and the LIGO team knew this. As previously mentioned, the researchers were fully expecting a discovery after the latest set of upgrades to Advanced LIGO. The probability statistics presented in the paper are meaningless in light of this skewed method of research. 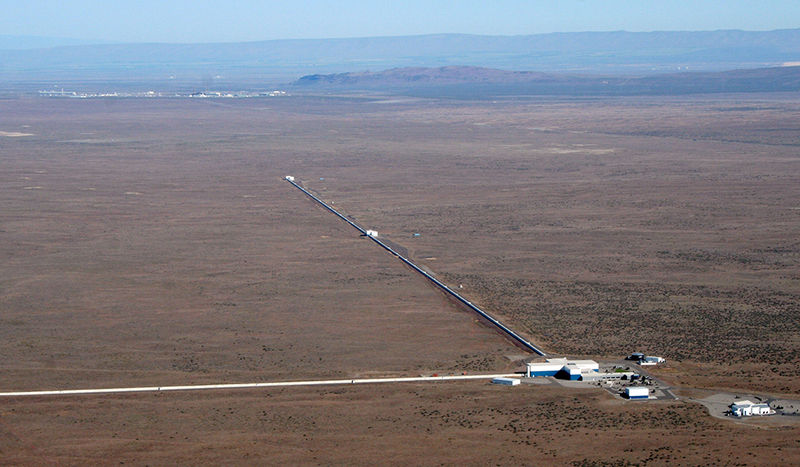 ♦ The original detection range given for Advanced LIGO at the time of its official start was 225 million light-years, more than three times the range of LIGO’s last run in 2010. But the LIGO team has determined that the gravitational waves they detected were at a distance of 1.3 billion light-years or almost 6 times the detection range of the instruments. So far no explanation has been given for how these objects were detected so far outside of LIGO’s stated range. ♦ The LIGO team originally predicted they would see several sets of gravitational waves per year with Advanced LIGO. But after operating the upgraded detectors from September 18, 2015 until January 16, 2016 – a period of almost four months – the only thing they had to show for it was the one single signal observed before official observations even began. ♦ Subsequent observations of the area of the black holes’ supposed merger and source of the gravitational waves have so far detected no corresponding object in any visible wavelength. The LIGO team converted the visible pulsation of light that was observed into an audible “chirp” in an attempt to reinforce their “ring-down” description of the supposedly merging black holes and the resulting gravitational wave generation. This has tricked the public into believing, and many so-called science websites and blogs into reporting, that an actual sound was detected as part of the LIGO team’s epic discovery. Not only was this completely unscientific, it was a complete misdirection on the part of the LIGO team in order to foster agreement with their findings. That last sentence succinctly summarizes what my studies uncovered concerning this supposed scientific discovery of the century. I started out seriously believing something had probably been detected by the interferometers, just perhaps not the merger of two black holes. But after spending the last couple of weeks thoroughly reviewing all the news and literature concerning the discovery and, most importantly, the published paper itself, I am now convinced otherwise. It is now apparent to me that this discovery is no discovery at all. In actuality it appears to be an attempt to create unfalsifiable, self-perpetuating, self-reinforcing results in order to desperately fit questionable observations into preconceived theories. I am not positing some big conspiracy on the part of LIGO to fool us all and plunge us into scientific darkness. I think it is more realistic that the LIGO team was becoming desperate to make the noise fit their templates in order to maintain their careers and continue to receive funding for their efforts. And that is what troubles me the most about the whole charade. LIGO is primarily funded by the National Science Foundation (NSF), a United States government agency. Therefore it is mostly US taxpayer money that is paying for this continued pseudo-science. As a US taxpayer I would prefer my money to be spent on real, testable, provable science and not decades of chasing theories and fabricating new ones. And while it is important to get the word out by posting to websites, social media and blogs I realize it will take additional efforts to actually put a stop to this wasteful spending and line of research. Petitions, protests and even litigation are options for drawing wider attention to these issues and forcing accountability onto those responsible. But who is responsible? The NSF? The LIGO team? Both? And what are the most effective options? 14 comments on "Questionable Waves"
I have several objections in addition to the ones listed in this article. 1. Before anyone can demonstrate ripples in spacetime, one must first show that spacetime exists. As Immanuel Kant would have said, if spacetime exists, where is it? And what is it made of? 2. Every physicist should know by now (deny at your own detriment) that spacetime is a block universe in which nothing changes and nothing happens. Therefore, nothing, including gravitational waves, can ripple through it by definition. 3. Gravity affects everything that exists, including massless particles and gravitational waves, if they exist. Since gravitational waves are given as local spacetime curvatures, their local gravity affect them as well. This results in an infinite self-referential regress. This infinite regress also applies to curved space or to any hypothetical intermediary force particles such as gravitons. Conclusion. I have many more objections but these are more than enough to destroy Einstein’s entire castle in the air. What we are witnessing is probably the greatest scientific hoax in the history of mankind. It will come back to bite the scientific community in their posteriors. And sooner than they think. It’s bad enough that we are about to be plunged into decades, if not centuries of Ptolemaic-like scientific darkness. But when I found out I was helping pay for the cause it was difficult to not get a little agitated.